When it comes to eye creams, I tend to be a little cheap. There, I said it. I don't tend to spend more than $25-30 on one; Mainly because I find when I factor in all of my other skincare products, I get what I need- which is mainly just hydration. That said, it can totally be fun to branch out and tread the waters of the higher end spectrum as well. 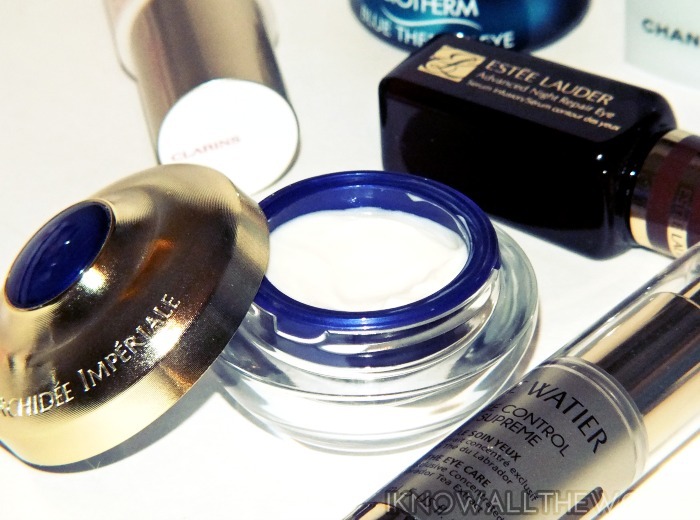 I've been testing out an assortment of eye creams and serums for the past few months from the likes of Biotherm, Clarins, Chanel, Estée Lauder, Guerlain and Lise Watier- an eye cream dream team, if you will- and thought it was time to share my results. Read on! 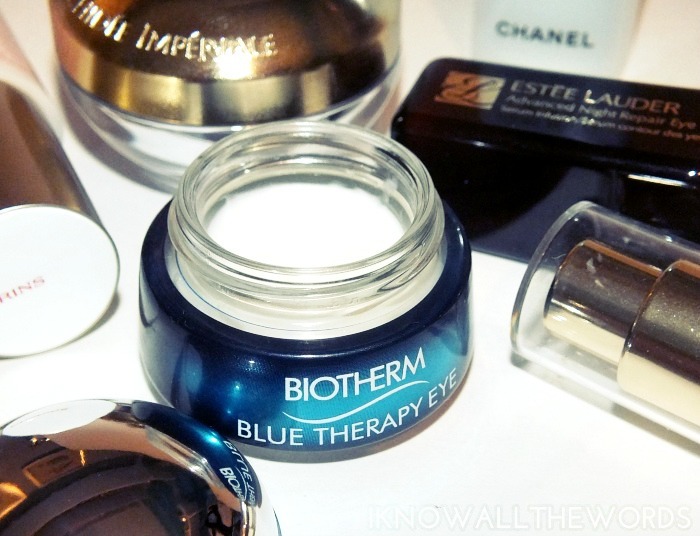 While I tend to prefer eye creams in tubes (more on that in a moment) but I have to say that the little blue pot is just so cute to me for some reason- it's like a little anti-aging spaceship! Of course it's the contents that matter most, and the Biotherm Blue Therapy Eye delivers a rich, hydrating formula but with a lighter feel. The texture of this isn't as thick and creamy as you'd expect in comparison to how it performs- it's creamy and dense in the pot, yet light feeling but rich on skin. I have really come to love the hydration from this and the fact that it smooths and brightens the eye area. 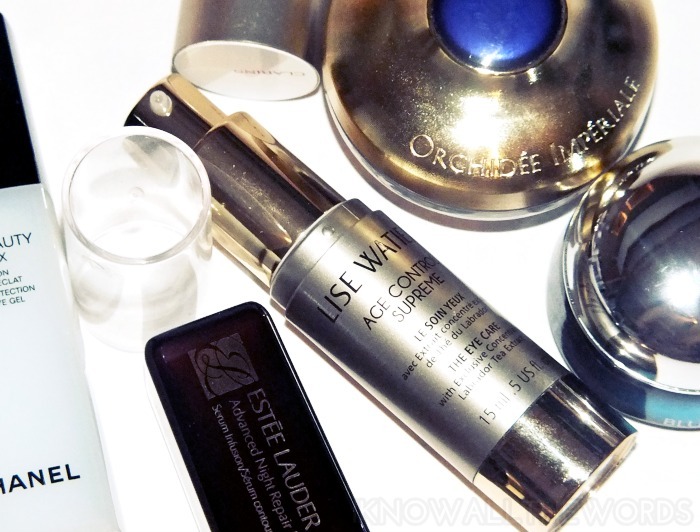 Lise Watier Age Control Supreme 'The Eye Care' gets immediate love from me as it's housed in a tube as opposed to a pot. You see, it's said that eye creams in a pot loose their efficacy faster as oxygen gets to the vital ingredients every time you open it. Plus, you've got to dip your finger in every time... Let's just say I prefer a product in a tube. As for the product, it has a texture that is more like a thicker gel than your typical creamy eye cream. The product has a slight wet feeling when you apply it that is quite soothing and refreshing. I really like the hydration I get from this and the super smooth feeling it leaves on skin. This is a great product for day as it isn't too heavy and leaves skin without any slip or shine. 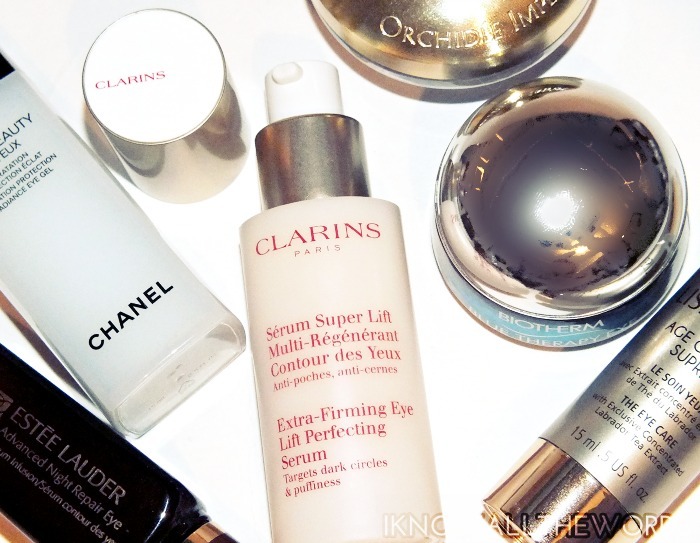 Clarins Extra Firming Eye Lift Perfecting Serum is a bit different, in the fact that it's a serum as opposed to a cream, but I've found it to be an interesting little product. The texture is heavier than your average serum and feels more like a primer. It takes a moment to absorb, but when it does, it leaves skin feeling hydrated and instantly fresher-looking. I never expect eye creams to do everything they claim, but Clarins does deliver on many of their claims with this one. I did find that with extended use, my eye area (under, and around) felt not only smoother in texture but also firmer and the creasing under my eyes was diminished a bit. Not too shabby, Clarins. Not too shabby at all. 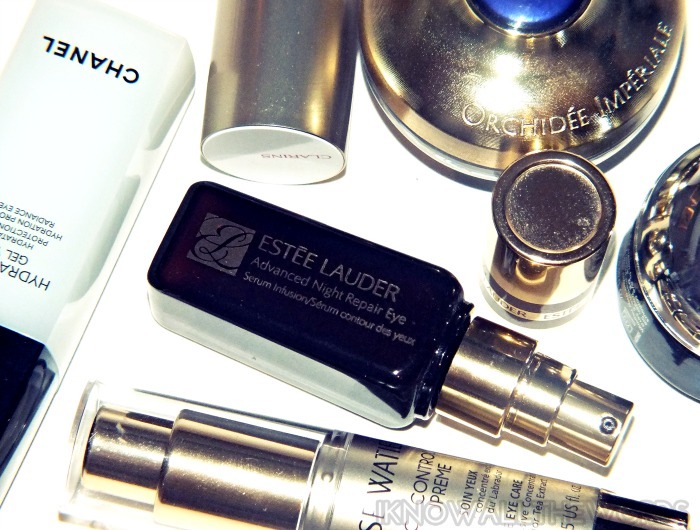 Estée Lauder Advanced Night Repair Eye Serum is the sister product to their massively popular Advanced Night Repair. While I've been using the eye serum, and have found it to provide decent hydration for this time of year, there is a corresponding eye cream to pair with this. The product, for me, is one of those that you can't really pin-point why you like it, but you do. From the first use to about the second week, I didn't notice it do much other than lightly hydrate, but since then, and more so when I'm not using it, I've noticed that it does work to reduce the overall look of dullness and tiredness and just generally made my eye area look and feel better. 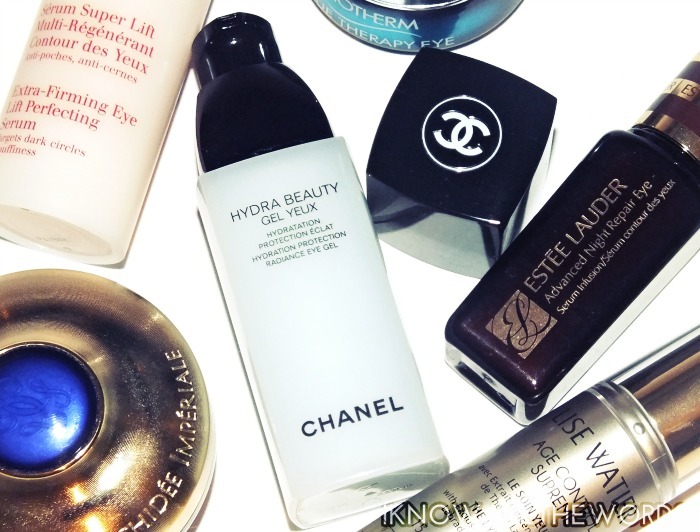 The Chanel Hydra Beauty Hydration Protection Eye Radiance Gel has a gel-cream texture that is actually much creamier than one would expect from a product labeled as a gel, but it's very light-weight and quick to absorb with a cooling sensation that can help combat puffiness. When it comes to high-end skincare I'm not one to impressed solely by the name- to be honest, if I'm going to spend money on Chanel I'd much rather buy cosmetics- that said, I've really come to like this eye cream. It's particularly great for day, and before makeup application as it hydrates nicely but absorbs completely and doesn't leave any slip on skin for concealer to slid around on. Last but not least, and also in the 'Holy mother of God that's expensive' category is Guerlain Orchidée Impériale Exceptional Complete Care Eye & Lip. Take a moment to absorb that price. Good? While I honestly would never purchase it for myself, I did enjoy testing this as it ended up being a pretty good product. I can't say it was amazing- which I would expect at this price point- as it did ball up a bit when buffed on my foundation/concealer over it. 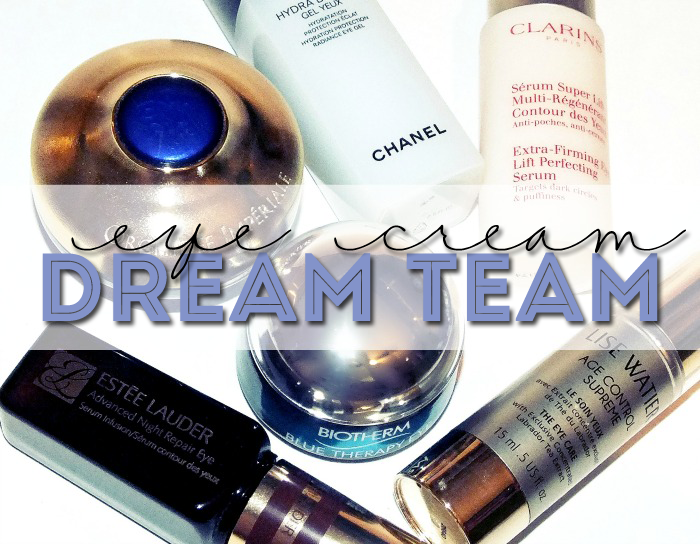 As an eye cream, this is one of the most hydrating of the bunch, but it's also the heaviest and creamiest. The texture is in no way heavy, but it is creamy and rich feeling when applied. I didn't intend on using this on lips as I usually find the feeling of a moisturizer on lips to be odd, you know? It's not bad, just different. Anyhow, I did try it, and am so glad I did because this does wonderful things for lips and the surrounding lip areas. The skin around my lips is prone to dryness and the occasional bit of hyper-pigmentation, but I found the dryness was significantly reduced- to almost nothing- around my mouth and my lips feel particularly smooth and supple when I use this, in a way unlike any balm I've tried so far. Overall, I enjoyed all of these eye products for various reasons- you really can't go wrong with any of them. What do you look for in an eye cream/serum? What are you using now? Do share!